Posters go up tearing down Halifax MLA. Update: The posters may already be taken down. Stroink's office called The Coast to let us know they couldn't see any up when workers went out looking this afternoon. Well, somebody had a busy Tuesday night. 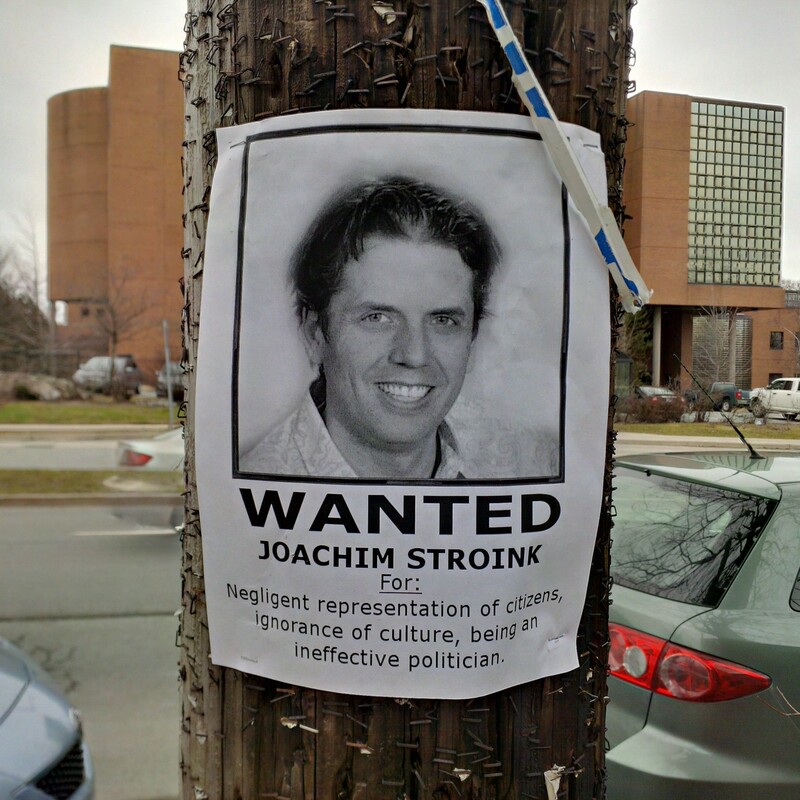 Residents in the Halifax Chebucto riding were greeted today to posters demanding the capture of Liberal MLA Joachim Stroink. No mention of whether the Trail Shop-owning Stroink is wanted dead or alive. The posters were up along Robie, from at least Jubilee Road to Cunard Street, and down some of the side streets. The “negligent representation,” “ignorance of culture” and “ineffective politician” charges on the poster could be for any number of Liberal maneuvers over the last month. Between film tax credit cuts, university tuition caps lifted and community service cuts, Liberal MLAs are facing their faire share of criticisms. Stroink, of course, has come under fire before for that whole blackface thing a couple years back. At the very least, Stroink is definitely guilty of wearing paisley (PAISLEY, for god’s sake). No one has claimed responsibility for the posters...yet. Could they be the work of angry film industry workers? Bored university students on summer break? NDP supporters looking for a fight? Reveal yourselves, sneaky activists! We reached out to Stroink’s constituency office, who were oblivious of the posters entirely. The NS Liberal caucus office didn’t immediately return The Coast’s calls. So, head ups Joachim: you might want to reconsider the paisley and opt for a poncho and cowboy boots instead.